I love learning the names of God; they tell us who He is. He revealed most of them while His chosen ones wandered in the wilderness. There are great books out there that tell us His names and what they mean. Reading through Isaiah this week and one of the names that God calls Himself is “Redeemer.” I love that name. He has redeemed us from the curse after all! In Isaiah 47 God is telling His people, thru the Prophet, how He is going to punish their rebellion and adultery and in the midst of it all, He calls Himself Redeemer. They had disobeyed His commands, ran away, and did the opposite of His will, sold themselves over to idol worshipping, and pretty much snubbed their stuck up noses at God, yet none of their (bad) behavior can change who God is! He remains Redeemer. I don’t know about you, but to me that is such good news. No matter how much a screw up, how many times I fall, forget Him, put my needs first, this list goes on…if I return to Him, repent, He has to forgive, He has to love, He has to show mercy, He has to redeem me from my sin, because that is WHO HE IS! I can’t change Him, don’t want to in fact. I like Him just the way He is thank you very much! 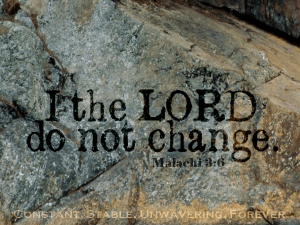 So look up some names of God, read your Bible and think about who it says He is, then remember, He will never, ever change, ever! I happen to think that is pretty amazing.